The renowned psychologist Carl Rogers noted that people are often unhappy because of a lack of congruence in their lives, which is another way of saying momentary complexity blinds us to the simple solutions of life. For Rogers, simply sitting with a patient and having them talk through their problems, without the therapist leading them or making judgments or giving advice, was the best way for them to let go of their problems. Rogers determined that when you give a person a safe and supportive space to think through things, they tend to do so more effectively. Right now, I want to give you a safe and supportive space to think, so you can let go of any extra baggage that’s been weighing you down. Try this: pause for a second to notice what’s going on in your body. Are your jaw muscles clenched? Are your shoulders or neck tightened? Do you notice a part of your body holding on to tension—perhaps tension fueled by something you’re subconsciously worried about? Most of us are holding tension in our bodies and stress in our minds, whether we realize it or not. Why are we doing this to ourselves? Why do we get tense, stressed, anxiety-ridden, and feel generally overwhelmed by life? It’s because life isn’t the flawless, calm, controllable experience we’d like it to be. We want things to be easy, comfortable, and picture-perfect 24/7. Unfortunately, reality is often the opposite. Bad things happen. Work is stressful. People let us down. We make mistakes and let ourselves down. We aren’t as proficient and disciplined as we’d hope to be. And life continues to frustrate us because there’s just so much to do and absorb and process. The problem isn’t life, or other people, or even ourselves. The problem is our propensity to hold on to what we want everything and everyone to be, in order for life to be good enough for us. And our reluctance to let go and accept things as they are is the root of our problems. Of course, we don’t want to feel this way, so we try to avoid what we’re going through. We distract ourselves with alcohol or TV or social media or whatever, which only makes matters worse. Angel and I have a ton of firsthand experience in this arena. A decade ago when we were coping with the back-to-back loss of her brother, Todd, and our mutual best friend, Josh, to death, the amount of tension and stress in our lives was overwhelming. We literally resisted reality in every imaginable way, every step of the way, for a long time. And although most people would say we were justified in our grief-stricken actions, we were undoubtedly holding on too tightly to our ideals, which stalled our ability to heal and grow. You would rather avoid the reality in front of you. — Most people make themselves unhappy simply by finding it impossible to accept life just as it is presenting itself right now. Remember, a significant key to happiness is letting go of what you assume your life is supposed to be like right now, and sincerely appreciating it for everything that it is. You are angered or agitated by your circumstances. — Being calm is a superpower that allows your mind to find solutions. Calmness is also a mental state of trust. Instead of overthinking or overreacting, you just surrender for a moment and allow yourself to breathe, which instantly gives you the upper hand in tough situations. You feel the desire to revisit an old negative habit or situation. — Be firm about your decisions today. Don’t crawl back to old habits and situations that weren’t helping you grow. Just keep reminding yourself why you decided to move forward. Stay strong and positive about what’s to come by being consistent with what you know in your heart is right. You are always short on time for your priorities. — If it entertains you now but will hurt you someday, it’s a distraction. Don’t settle. Don’t exchange what you want most for what you kind of want at the moment. Study your habits and rituals. Figure out where your time goes, and remove distractions. It’s time to focus on what matters. You always feel like you’re not ready yet. — If you wait until you feel 100% ready, you will be waiting the rest of your life. Realize this! Some people wait all day for 5pm, all week for Friday, all year for the holidays, all their lives for happiness. Don’t be one of them. You long for life to be easier. — Daily effort is never wasted, even when it leads to discouraging results. For it always makes you stronger, more experienced, and more educated in the long run. It’s all just a part of the growth process. With effort, things will gradually get better, one way or another. Be patient and remind yourself: Life never gets easier, you just get stronger. You worry constantly about what others think of you. — One of the greatest freedoms is simply not caring what everyone else thinks of you. Sometimes you need to step outside, get some air, and remind yourself of who you are and what you want to be. Stop waiting for others to tell you how important you are. Tell yourself. And believe it. You often catch yourself judging others. — A significant yet dangerous temptation in our culture is to judge people and box them into a particular narrative. Don’t do this. Don’t be lazy and make empty judgments about people. Be kind. Ask about their story. Listen carefully. Be humble. Be teachable. Be a good neighbor. You resist and deny the possibility that you may be wrong sometimes. — When you hear only what you want to hear, you’re not really listening. Listen to what you don’t want to hear too. That’s how you grow. There’s always room for a new perspective, a new step, a new possibility, a new beginning. You tend to focus on the little things that drive you nuts. — Sometimes we scrutinize and dramatize the petty annoyances in our lives until we’re blue in the face, and then we sit back and scratch our heads in bewilderment of how unfulfilling and empty life feels. You catch yourself desperately wanting to control other people, the past, etc. — The most powerful changes happen in your life when you decide to take control of what you do have power over instead of craving control over everything you don’t. You never put yourself first. — Start prioritizing your inner peace. If you need to temporarily distance yourself from someone who brings you down, do so. If you need to forgive yourself or someone else so you can move on, do so. Take a deep breath and start doing what it takes to get to a better place in your head and heart. 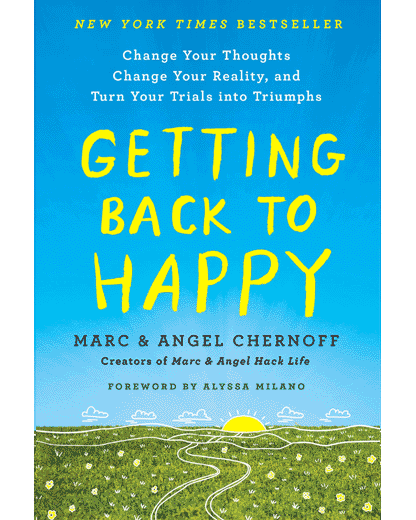 And sometimes we are blessed, in a bittersweet way, with an event that shakes the foundation of our lives and makes us realize “I have to stop doing that.” As I mentioned in the intro, Angel and I have been there. One of the key things we learned from personal experience, and also from coaching hundreds of students and live event attendees over the years, is that the vast majority of pain and sadness in our daily lives comes from our propensity to hold on… to just about everything. When you develop the skill of letting go, and practice it daily, you automatically prepare yourself for any challenge that could possibly come your way. For example, if a major, unexpected change arises in your life, it’s only a “bad” thing if you’re holding on tightly to the way you wish life could be—all the expectations and ideals you have. But if you let go of that wish (and those expectations and ideals), the change isn’t bad. It just makes life different than you expected, and it could be a good thing in the long run if you embrace it and see the opportunities it provides. It’s stepping forward, untethered, with a present mind and a lesson learned. I challenge you to leverage the reminders—the signs—above to do just that. If you’re feeling up to it, I’d also love it if you left me a reply below. What part of this post resonated with you the most? Finally, if you haven’t done so already, be sure to sign-up for our free newsletter to receive new articles like this in your inbox each week. Thanks for emailing me the link to this post today. It’s truly another powerful and thought-provoking read. In fact, this one is going to be printed and re-read one the next few weeks, along with parts of your book that I’ve highlighted. Thank you for the guidance and tools to be a better human being. And, I’ll be seeing you two in San Diego next month at your Think Better event too. My husband and I both have tickets. Can’t wait! The “letting go” I need to make most involves your point about not worrying what everyone thinks—the idea that I should be more successful in my parent’s eyes than I am…the fact that I need their constant approval, etc. Living up to their rigid and mostly unreasonable expectations drives me mad far too often. I’m 32 years old and I often find myself tip-toeing around my own goals and dreams because I’m afraid to disappoint others. Life is too short for that. I’m finally beginning to understand how to create the right balance and momentum I need. Anyway, I can’t make your seminar this year, but I am enrolled in your course now, and looking forward to the next module and coaching sessions. You’ve already been invaluable resources in my life, and for that I am grateful. Another day, another incredibly useful email/post from you two! Thanks. I so agree with the fact that we often get stuck on our own ideals and expectations, and that we let them overshadow the real beauty and potential in our lives. And I also deeply resonate with how you stated the “sign” about the distractions in our lives. I focus too much on leveraging distractions to ease my mind about things. Not a good crutch. Thanks for the reminder. Well, this couldn’t have arrived at a better time, so I know it was more than coincidence. Thank you. Your telling me. I loved the story. Where letting go and no waiting any longer for your purpose I life. Great! Example for me, I’ve waited long enough it’s time to go into action apply for a new job. I want new training, new experience go somewhere in life and have a purpose. I love it. I think I have the signs. I need to let go of unnecessary baggage in my life. Thanks a lot for sharing. Numbers 4,7, and 8 resonated with me. Thank you! The whole post is what I needed to hear today…since my husband passed I’ve been learning and listening…two strengths I wrote down are…Change isn’t bad it just makes life different than you expected…Also, it’s not about forgetting it’s about remembering without fear… priceless words. I just got my hope back this year and I am moving forward more and more without fear. Thank you for this article… more to work on but embracing the challenges…have a wonderful week! I totally agree. I also lost my husband and am struggling to move ahead as an individual versus a couple. If you really think about what Lewis is saying i believe people can eliminate most if not all of their anxieties. Thank you! Positive self-talk really helps me deal with some past issues of my life. Sometimes we feel that we’re inferior to others. The truth is we’re all humans and we all made mistakes in the past. I don’t dwell on my past mistakes anymore as I used too. I don’t let it distract my goals in life. I’ve needed these truths forever. Can’t understand why I’m holding on to so much and not relinquishing my ideals maybe it’s becausr I believe they give me a footing. But nothing is sure in this life. I don’t think I know how to navigate. Thanks for the insight. This is wonderful. Great reflection points. Thank you for the email this morning. So much of this was helpful to me. I think I’ve spent decades believing that if I let go of my ideals and expectations, I am losing my self. Ideals are important underpinnings, but expectations are just an estimate of what might happen. And sometimes, an estimate is wildly inaccurate. I need to correct my mental math — and even examine those all-important underpinnings to see if my foundation really is built on a rock. It’s true, I’ve missed out on much in life because it didn’t go as expected. But I don’t have to spend what’s left in that same rut. What a lovely reminder of how full our lives already are and to move through our sometimes limited sight. I have been working on expressing myself more authentically and honestly. Because I have felt so much shame in my life, I was always afraid to express my true feelings and options. Never good enough or smart enough compared to everyone else was always with me. Your book and reading your daily posts have finally given me hope, courage and strength to break out of this mold. Thank you from my heart for your courage and strength to share your story and wisdom. This article is good for me in two ways. Some of the signs to let go really resonate with my present situation, but others enforce the things that I have been and continue to do “correctly”, or in a way that is best for me. This mentality last year helped me navigate through the unexpected surgery, diagnosis, and treatment for ovarian cancer with minimal difficulty, and with major silver linings! But unfortunately, afterward I shifted into a PTSD “live like I am dying” phase, where I went back to a relationship I had ended a year earlier, and am currently stuck in again, because “You feel the desire to revisit an old negative habit or situation. — Be firm about your decisions today. Don’t crawl back to old habits and situations that weren’t helping you grow. Just keep reminding yourself why you decided to move forward. Stay strong and positive about what’s to come by being consistent with what you know in your heart is right.” He was wrong for me then, and is wrong for me now, but he was the easiest and only option to find intimacy. Almost 6 months later, I am regretting the decision, since he’s in deep again, and I’m ready to move on. I thought I had a safety net because he was seeing someone else, but I just learned he ended that because I’m the love of his life. Crap. Lots of negative emotions on my end… guilt for my selfish actions, questioning whether I should settle since he’s so elated, and since I know all he ever wants to do is make me happy, even though he fails miserably. When we’re together, he’s physically present, but not mentally or emotionally, leaving me feeling very isolated and alone. Do I embrace the present as it is? It’s near impossible unfortunately. I feel bad that I’ll be hurting him again, but he didn’t seem too terribly affected by it the last time. Such a conundrum. One day at a time. Do NOT settle. You deserve to be happy. You are not responsible for his happiness. I waited way too long to let go, and while I can never get those years back, I can move forward focusing on what makes me happy now. You are worth it. Take care of yourself. I think this paragraph is very good advice but a little too generalized. There are major, unexpected changes in life that are bad and are going to be bad regardless of what your ideals and expectations are. However that is a part of life and dealing with those changes in a positive way is the best anybody can do. 2,4,10,11,12…time to turn away from email & other distractions to get my day started. If I put my priorities first, I can look forward to the day instead of dreading and avoiding it. Life doesn’t become easy, we become stronger. Thanks for the post, this is an eye opener for me and a chance to ensure my goals are met by the end of 2019! Words cant express my gratitude. One of the things i said i would do this year was set boundaries and i need to have quiet times with God and on my own to recover from years of abuse etc, i have nothing left. Heck yeah, letting go can be hard but can also make us feel so grown up. Your words really hit home. Great insight. I feel your teaching has love, gentleness and kindness as it’s basis. Thank you for reaching out to help people be happier. I have enjoyed all of your posts. I struggle with what others think of me. This resonated with me the most. I know it’s ridiculous and destructive. I’m looking for techniques, things I can do or read, some way to move off. The worst is knowing that so many people are dealing with their own struggles that they aren’t aware of being hurtful. I know this and still care too much. I vow to improve. Syncronicity happening again with many thanks for the timing of this email along with 3 other indications that I need to let go of sooo many expectations of myself. I just wanted to say: Thank you. Really. Thank you for such encouring words. Thank your beautiful reminder I need to let go. I found myself going through a loss, and I’m sure in my heart your post is indeed one of the signs I’ve been looking for to find my way back to a better place. I really appreciate for sharing the great encouragement and guidance. I’m too – having a hard time to find the true story in my own family. Thank you this post! I often struggle with all the things you mentioned. I’ll keep this to remind me of the things that are important. “Start prioritizing your inner peace” may become my new mantra. As a working mother who is responsible for so many lives, it’s so difficult to remember to prioritize yourself. I try to remember that every airplane ride includes instructions to put your own mask on before assisting others. Prioritize your own oxygen so that you’re strong enough to help. Prioritize your own inner peace so that you can bring calm and strength to others. I’ll be 68 this year, and my life hasn’t turned out the way I assumed it would, you might say. The first three points of the post resonated the most for me (would rather avoid reality, anger/agitation, desire to revisit the past). I also long for life to be easier and I judge others much too often; I’m working on both. This post had a lot of value for me. I’ve already revisited the post more than once in order to absorb the lessons. Thank you for it! There are a lot of reasons to let go but the biggest one for me would be peace of mind. The more negatively cluttered the mind gets. And negative clutter ultimately leads to unhappiness. Great post Two words”letting go” but so powerful. This advice should be heard when we are young and going through a lot of angst. The ability to let go enables us to to be at peace with ourselves and in so doing helps us to concentrate on what really matters in life and to make the most of it the way you want. I felt so compelled to respond as we have so many parallels. I divorced my sociopathic husband after 3yrs, had 2 little ones, had no idea where we were going to go.I am bionic (sounds cooler) lol- disabled, so fixed income, raised my children myself , and ex has unlimited funds, bought them cars etc, and they left me for him. I have gone thru cancer, idiopathic pancreatitis, many lower back surgeries, then neck surgeries, internal jewelry 13 screws in back and neck with metal plate. Guess who got the recalled mesh implant- surgeries and radiation while taking care of kids myself. I have to sell the family home- cant afford it. My kids are special needs and I paid for their needs-ex scares me. So my money went to my daughters CRPS and POTS among many other wierd things many haven’t heard of, instead of paying more on the house. I don’t want to live in an apartment (have pets including 2 parrots) havent married again as trust is an issue- was assaulted at age 55 for 2 days in Mar 2017 and a 19 year old ruffled me in Aug 2017- the same age as my daughter… I have PTSD so bad though I haven’t gone in- on the list. I have to downsize which I can barely get up in the morning and I need to make decisions in a week. A friend, God bless her, is firmly gently pushing me to make tough decisions. But ,I haven’t been living…just existing- that’s not living.I am going to be myself again- the person I forgot how to be. I dont know if you have a faith- I am Christian though just recently. I was not going to be here more than once. But something stopped me as each of us has a purpose here. I wish God would let me know what it is, but it is for us to find out. I am pushing myself out of this dark hole I have been in, and I am going to laugh again,I dont know where I’ll live and pray that my kids will come back into my world. They are the loves of my life. I would enjoy meeting someone although it seems the good ones are taken. Maybe it’s because I need to like me again- or rather love me. I was put down by everyone in my world and my self esteem was rock bottom. But, no more. Don’t worry about what anyone else thinks- you have no control over that- who cares what they think. What you need to focus on is what makes you happy and grab on to it. I have no idea where I will live as I am disabled, single, and minimal retirement- hurt back as a trauma nurse at 28. And I wanted to say five and do so many things. But one thing we can do and I make a point of it is to smile when I can get outside, make others smile by being friendly- and it ultimately makes me happy. We have alot in common. It depends on how you look at things and what you want out of life. I might be homeless. I might only be able to afford an RV. (My fish, parrots and cats would love it) lol! I’ve been so stressed out and hurt- I give it to God or the powers that be- because I can’t do it myself. I guess I need to rely on faith in my situation-wierd health stuff, and emotional issues to conquer. I know I want better- but it’s not going to be easy. Make changes that make you happy, Sherlynn. I will pray for you. I feel you SM there are many people out there like you. Hey, cheer up. Do not base your happiness on other people. As you stress yourself thinking about those who should be loving but don’t, you forget to see the ones who loves you. You have to start thinking about yourself. You great, a nurse who cares for others, you’ve got to take care of yourself as well. It starts with you, books may help, or counselling or therapy, but only when you decide that that’s the way you want to follow. Stop being hard to yourself. At 55, you know both ends of life. You don’t have to lead all your life in grief. You deserve joy too. I honestly wish you well my sister. Open your eyes and see the beauty around you. Emotionally;: you should find out if that’s person is reliable in the relationship,. Or something That’s not honestly. and much walk away. That’s not judgmental . It is necessary not only to train your body, but your mind as well. Think positively, let go unnecessary tbings (or people) from yor life and you’ll be happy! It is not easy to let go, though… It is necessary to train that skill , like you train your body for more excersises. I particularly liked – it’s not about forgetting. It’s about remembering without fear. I believe it’s often good to update and edit our life stories with a more mature and experienced viewpoint that enables us to have a different perspective on events of the past and our evaluation of people in our lives. Thank you for these wise words and reminders that we control little in our own lives. We really can only control ourselves and our reactions to what life throws at us. The realization that we can CHOOSE to hold on or let go is a wonderful feeling. Sometimes we go down rabbit holes for years and get stuck there. Deep down we know it’s killing us, but it’s our choice stay stuck or let go. Thank you for clearing up the confusion and showing us how to get back on track.